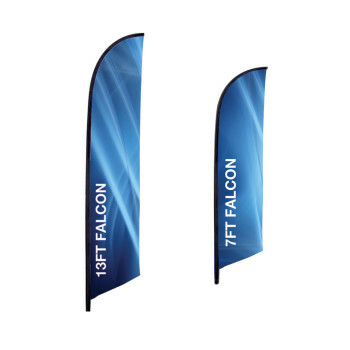 This Single-Sided printed banner is a replacement graphic for the 7ft and 13ft Falcon Banner Stand. This Falcon Flag is intended for display outdoors using the spike base, but can be used inside using the X-base. The X-base is also a great option for placing this 7ft banner stand on concrete or other hard surfaces. The banner design is customized to your graphic artwork, and is printed on polyester mesh by the process of dye sublimation. Our inks heavily saturate the material to create a “bleed-through” effect for our single-sided displays such as this one. 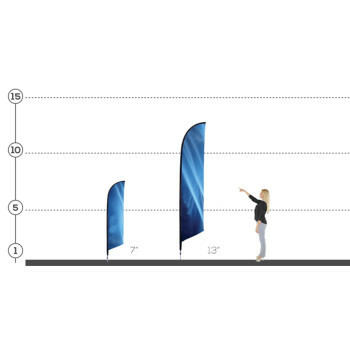 Black flag trim is sewn on the edge of the graphic (pole-side), leaving a pocket for the pole insertion. A set of grommets are installed on the bottom of the trim in which the short bungee cord (included) can loop through and snugly attach the graphic to the base.